For many believers, the subject of the End Times stirs confusion, apprehension, and dread. No longer! 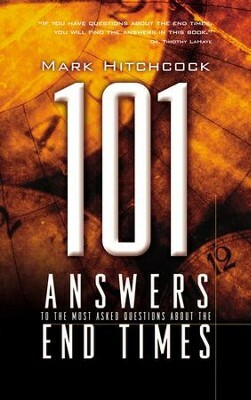 This user-friendly manual answers 101 of the most frequently asked questions about everything from the Pre-Tribulation Rapture, the Antichrist, and Tribulation to the Second Coming and the Millennium. Prophecy expert Mark Hitchcock offers a biblically authoritative resource for understanding God's plan and a reason for peace instead of anxiety about each believer's role in it. This eBook contains links to online charts for viewing and printing. Mark Hitchcock graduated from Dallas Theological Seminary and has since pastored Faith Bible Church in Edmond, Oklahoma. He has written six books, including 101 Answers to the Most Asked Questions about the End Times, The Coming Islamic Invasion of Israel, Is America in Bible Prophecy?, and What on Earth Is Going On? Mark and his wife Cheryl live in Oklahoma with their two sons. I'm the author/artist and I want to review 101 Answers to the Most Asked Questions about the End Times - eBook.